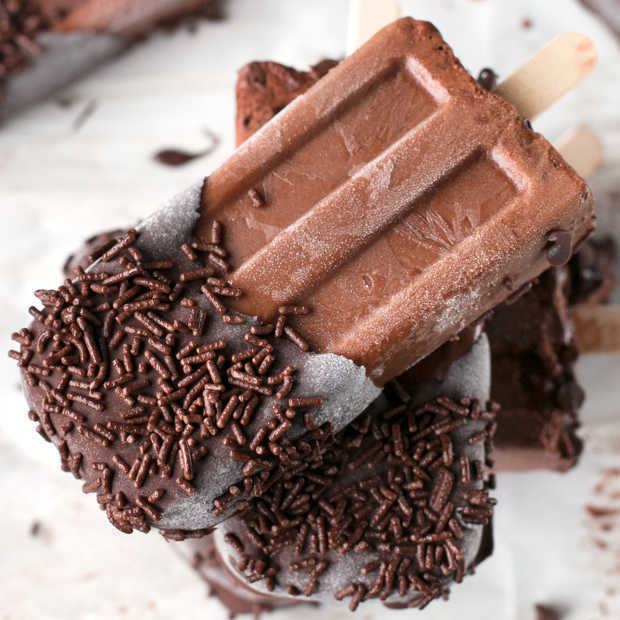 Dark Chocolate Dipped Mocha Popsicles are where the perfection of coffee and chocolate combine in utter bliss. 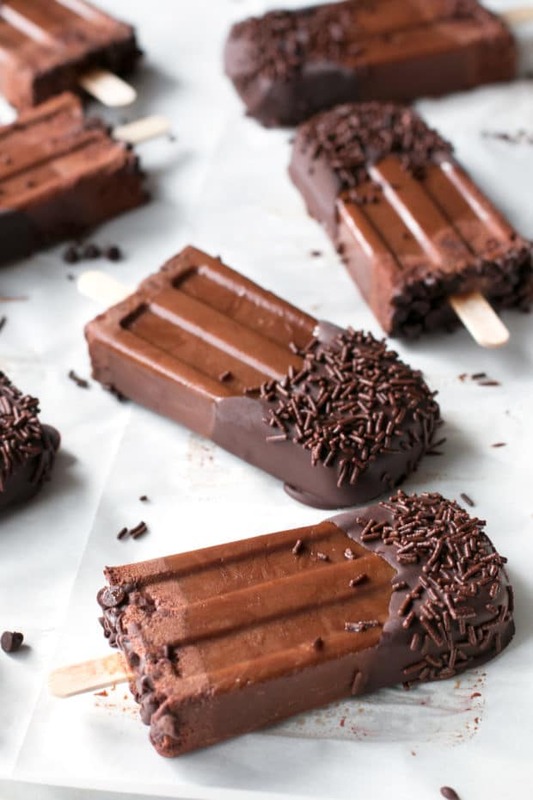 This summer treat is ideal for a sweet (vegan!) pick-me-up in the middle of the week or to cool everyone off with at your next summer party! With a double dose of chocolate and the rich coffee flavor from pure coffee extract, how can you resist? Disclosure: This post is sponsored by Nielsen-Massey. While I was compensated, as always, all opinions and the recipe are my own. Thanks for supporting the brands that support Cake ‘n Knife! Coffee and chocolate are one of those flavor combinations that are a match made in heaven. Much like peanut butter and jelly. Obviously I could play this game forever. When I was in college, chocolate-covered coffee beans were my JAM. I would have a bag of them sitting on my desk in almost every class (especially those night classes), quietly munching on them, willing them to help my hunger subside and give me a little jolt of energy to pull me through an exquisitely long lecture. Thus chocolate-covered coffee beans have inspired several recipes (see this mocha cocktail and these mocha cookies) here on Cake ‘n Knife. That chocolate and coffee combo (aka MOCHA) is such an easy one to fall for. It’s rich and full-bodied, with an ever-so slight bitter taste to keep your taste buds on their toes. These dark chocolate dipped mocha popsicles are my favorite mocha recipe to date. 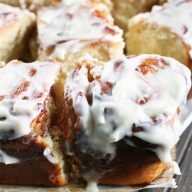 A big part of the full-bodied flavor comes from the Nielsen-Massey extract I used in the recipe! Nielsen-Massey’s Pure Coffee Extract is carefully distilled from premium coffee beans, leaving you with a full-bodied flavor unlike anything else. The best part is this extract is easier to keep on hand than coffee beans or ground coffee that typically lose their flavor over time. Instead coffee extract will last you a longgggg time and the flavor won’t fade! 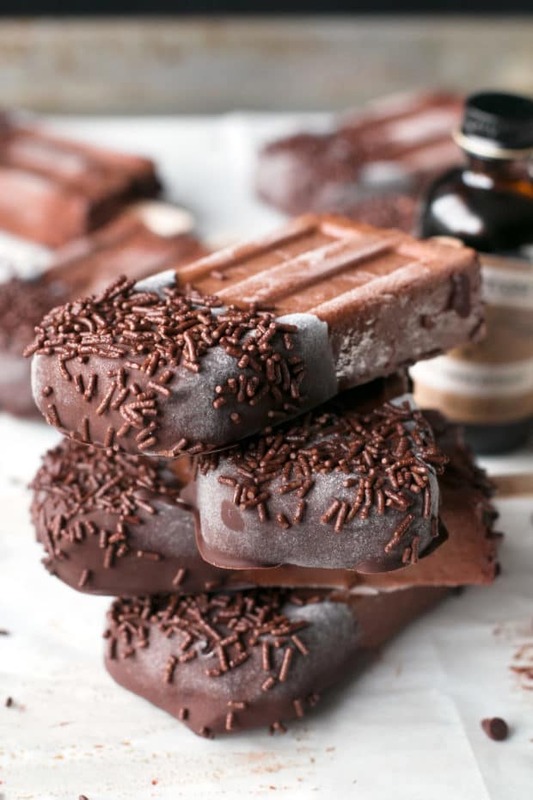 The rich coffee flavor perfectly compliments the slightly bitter dark chocolate in every single bite of these popsicles. Not to mention, you are getting a double dose of chocolate with the extra dip of dark chocolate and sprinkles. 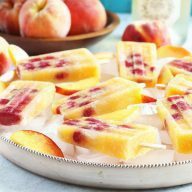 PLUS these popsicles are vegan, so they are approachable for so many people! I have been a long-time advocate of the Nielsen-Massey brand in my baking and now, in my summer frozen treats. It’s pretty amazing just how much pure flavor a small amount of coffee extract you need to pack a punch of coffee flavor. All of their products are all-natural and certified gluten-free, so you don’t have to worry about pesky ingredients you can’t pronounce or worrying about a possibility of gluten if you are allergic. 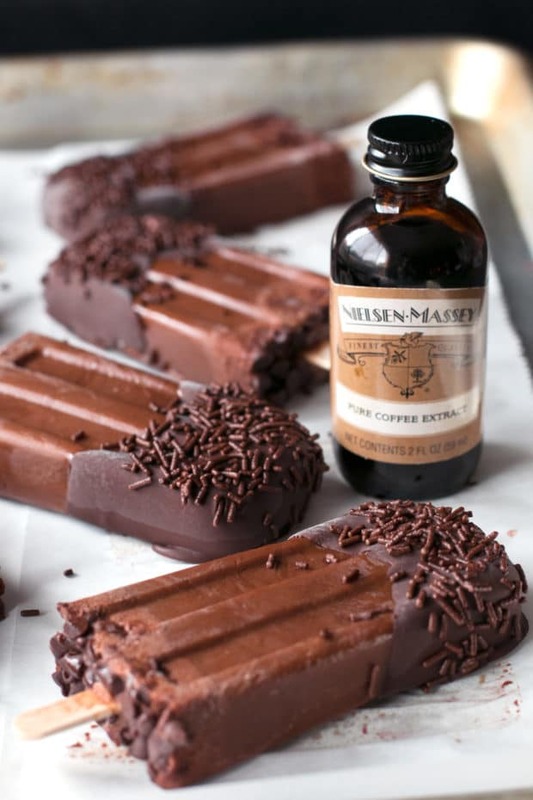 Whether you are baking up a storm, cooking dinner or making fabulous sweet frozen treats for a crowd, you seriously need to consider turning to Nielsen-Massey for intense flavor in little magical bottles. For more uses and pairings, check out Nielsen-Massey for yourself here! 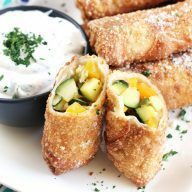 Want some more recipes to make with Nielsen-Massey products? Be sure to follow Nielsen-Massey on Facebook, Instagram, and Twitter for recipe inspiration. 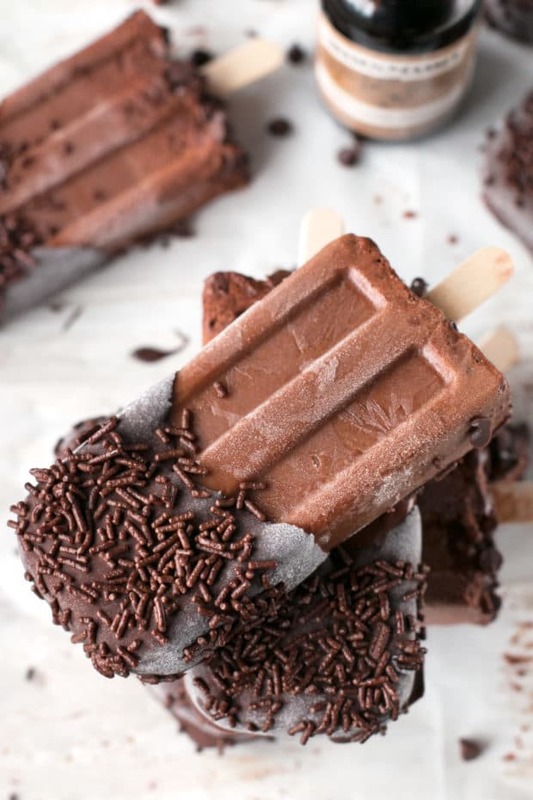 Pin this Dark Chocolate Dipped Mocha Popsicles recipe for later! 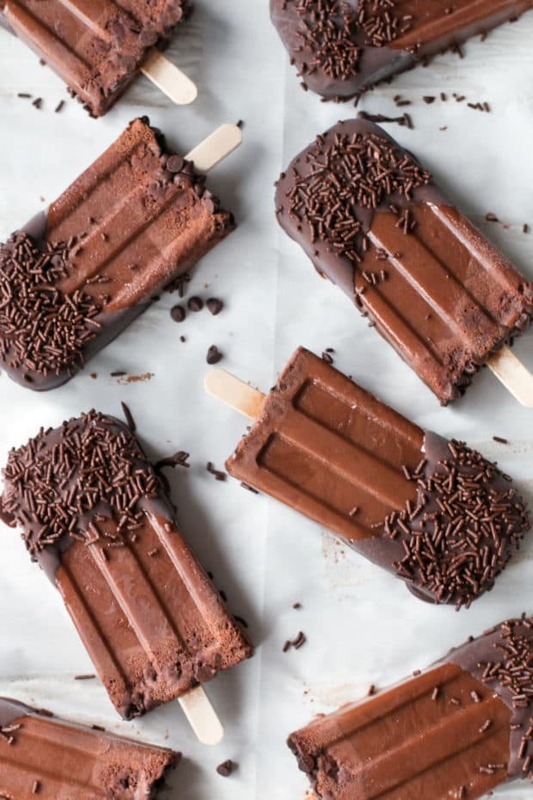 Chocolate and coffee come together in one fabulous popsicle that'll cool you off AND satisfy that sweet tooth. In the bowl of a food processor, combine coconut milk, honey, cocoa, vanilla extract, coffee extract and salt. Puree until fully combined. Pour mixture into a bowl. Stir in mini chocolate chips. Fill 8 popsicle molds with the mixture and cover. Freeze for two hours. Insert popsicle sticks. Freeze overnight. Remove popsicles from their molds to a parchment paper lined baking sheet. Freeze for another 2 hours. In a microwave safe bowl, melt dark chocolate chips with coconut oil in 30-second increments, stirring between each, until melted. 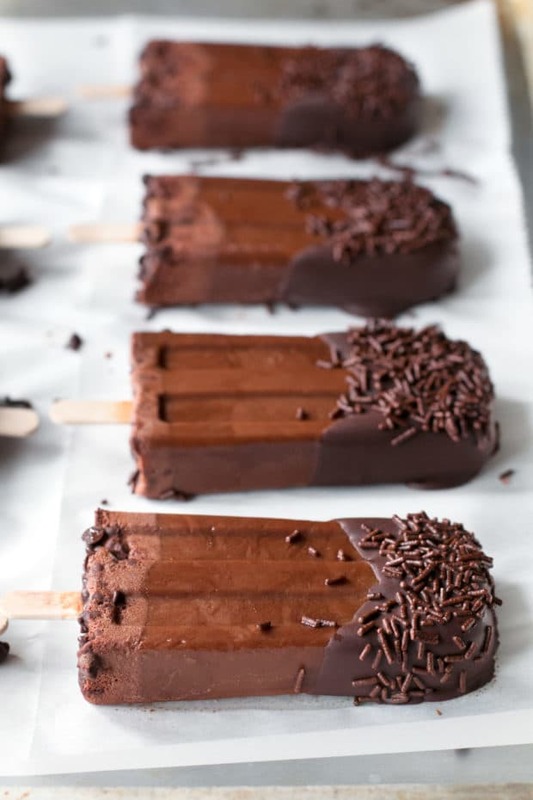 Dip the popsicles into the melted chocolate and sprinkle with chocolate sprinkles as desired. Return to the parchment paper lined baking sheet and freeze for 30 minutes before serving. 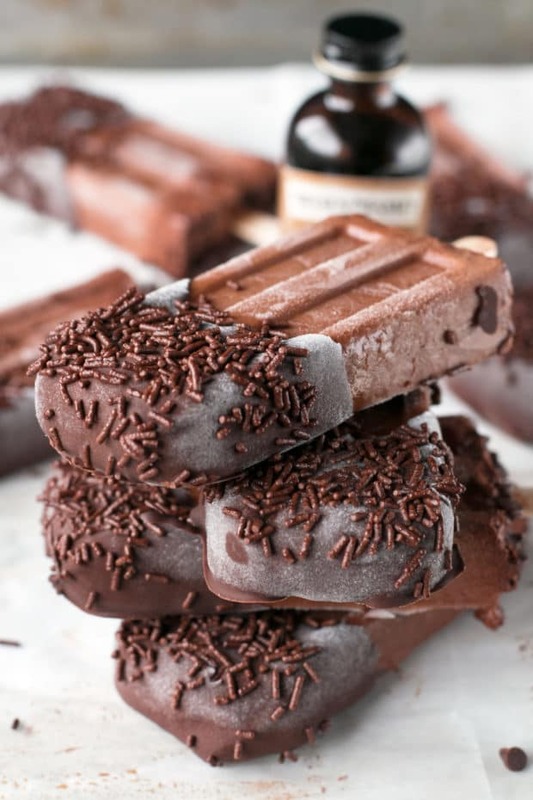 As a lifelong sucker for chocolate and coffee combined, these popsicles are TOTALLY going to be made in my kitchen soon! SO GOOD! Delicious – and so pretty! 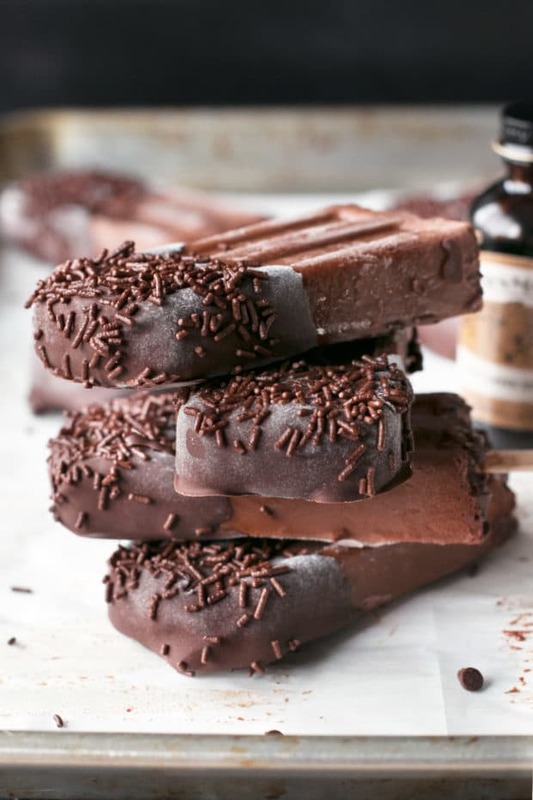 I am going to make these dark chocolate mocha popsicles. 1) These popsicles look bomb. 2) I need that coffee extract in my life.